Full story about refining Heljan’s class 47 can be found in the new issue of Model Railway Journal, no. 258. 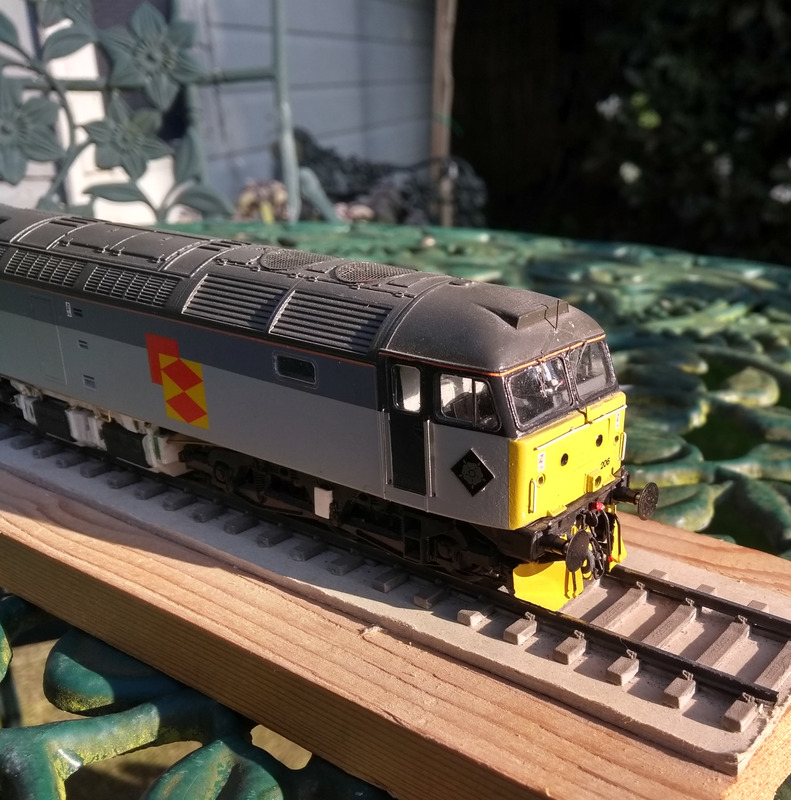 A slightly different approach from the previous post about modelling class 47s – revisiting the Heljan model. It uses Alan Gibson wheels with new pick ups from 0,33mm handrail wire – the original pick up strips didn’t line up with the tyres so were cut back and the new pick up wires soldered to what remained. The result seems, at least I hope, to provide a reliable solution. It certainly moves rather nice up and down my test track! As it was a quick conversion the work one the underframe was kept to a minimum – ‘moulded gaps’ between the battery boxes were removed a couple of obvious pipe runs and fire extinguisher points were added to fill the gaps a bit. A very simple job which made quite a difference was adding a piece of 20 thou of packing behind the each bufferbeam which corrected the front end rather nice and ensured the valance stood slight proud of the cab front. A side view of 47212 which shows the minimalist approach to the underframe. Selective removal of moulded areas where there should be gaps really enhances things for a minimum of effort and a couple of pipe runs here and there take it to a level well away from its original appearance. The body is basically pure Heljan with just a few changes – the most obvious one is the replacement of the roof grilles with Shawplan Extreme Etchings version which are delightfully fine. A more subtle change was to replace the handrails on the cab fronts with my favoured 0,33mm nickel silver wire from Eileen’s along with a centre lamp iron folded up from a double thickness of 5 thou brass strip. It’s amazing the difference that new handrails make to the appearance of the whole model! 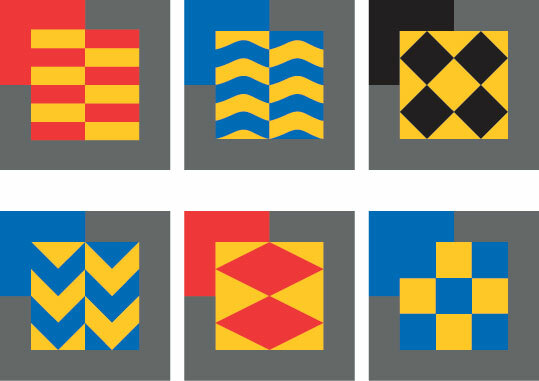 Repainting was confined to the roof and warning panels – Precision paint for the roof and Humbrol Trainer Yellow for the warning panels and transfers were reinstated as necessary using Fox products. The final job before weathering was to add glazing using a Laserglaze pack from Shawplan along with their wipers. The Shawplan fan grilles can be seen in this view – they do look rather nice. The use of 2 thou stainless steel for the mesh means they look so delicate. The final result, once it was weathered, certainly captures the look of the prototype despite the Heljan model being a tad over width. Read the full story in Model Railway Journal no. 258! 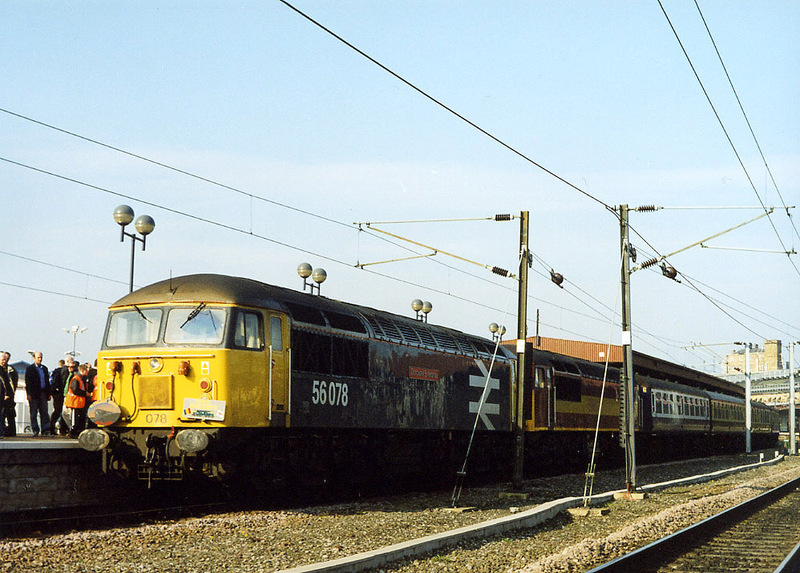 Class 56 passing Brocklesby, circa 1994. This is a benchmark for me. The layout will probably be easily identifiable to you – Mostyn by the Barrowmore Model Railway Group. But it’s the loco which is of real interest to me. This photo always reminds me of how good the Heljan Class 47 can look. We know its faults but with a subtle touch, it can be made into something very special. This is the work of Philip Sutton. Photo courtesy of Gareth Bayer. Heljan entered the UK market in the early 2000s – this example of one is therefore relatively early. It’s by Philip Sutton, formerly of RAIL Magazine, ModelRAIL and Rail Express, best know now through his Sutton’s Locomotive Works. The model may have its faults but in the right hands the result is quite something. When you really look there’s not a huge amount which as been done to the model – new wheels, bogie frames correctly spaced (this was an issue on the original releases as the were set too close together), new handrails and renumbered and weathered. But look at how well it’s been done – the subtly of the weathering. The buffer in primer. The grease marks on the buffers. It’s a beautiful piece of model making. It’s not that I’m tight with money. I’m just full of guilt when I spend money on myself. For example, a DCC sound fitted, RTR loco can cost three hundred pounds – the Class 24 from Sutton’s Locomotive Works in its top spec with P4 wheels comes to £310. That’s a family holiday! Well, at least a very nice long weekend somewhere nice. Or it’s one thing. For me. No one else benefits, regardless of how much I claim otherwise! Now that model is a very nice model and is good value for money. No doubt there. The first budget class 47 based on the Lima model. No, this is my own dislike of treating myself. It’s all from having been made redundant a number of years ago. It’s left me with enormous sense of guilt for spending money on myself. And that summer also lead to me looking at a couple of budget projects. This way of looking at things hasn’t left me either. It’s not that I want everything as cheaply as possible – some things are worth spending the money on. Look at Shawplan’s range of parts. Not only are they the best on the market, the cheaper alternatives are either very basic or just plain rubbish! Plus the end result is far better than any other method could achieve. Raw Materials – A Lima class 47 just as it comes. Far from perfect but as it stands, I always feel that the Italians captured the type quite well. It has more to do with combining the best elements and parts together whilst being able to see the potential in some older and more basic starting points. The Lima class 47 is a prime example of this. At one time you could pick them up for as little as £15 in really good condition at toy fairs. Even with a set of Ultrascale wheels you could then achieve a high spec model for an outlay of about sixty quid. And because of the piecemeal way you can buy bits as you go along, this cost can be spread out too. And this is how the loco you see here came to be. So at the very early stages of planning and thinking about West Halton I knew this was the sort of motive power I would need. And although the Immingham based machine I chose was actually a Petroleum sector loco it could very easily have ended up on trip workings in the Scunthorpe area. I chose 47294 after I found a photo on the net of it on a train of BDA steel wagons – perfect! For a long time the Lima model of the class 47 was the best one the market. To be fair, it was either this or Hornby and the Hornby model has been around in one form or another for a very long time. Although dimensionally and shape wise it’s actually very good, compared with the Lima model it was very basic but out of the box it never looked very good. (That said over on EM Gauge 70s Peter Johnson has worked miracles with Hornby bodies showing how accurate it is fundamentally – have a look here and scroll down a bit, superb.) 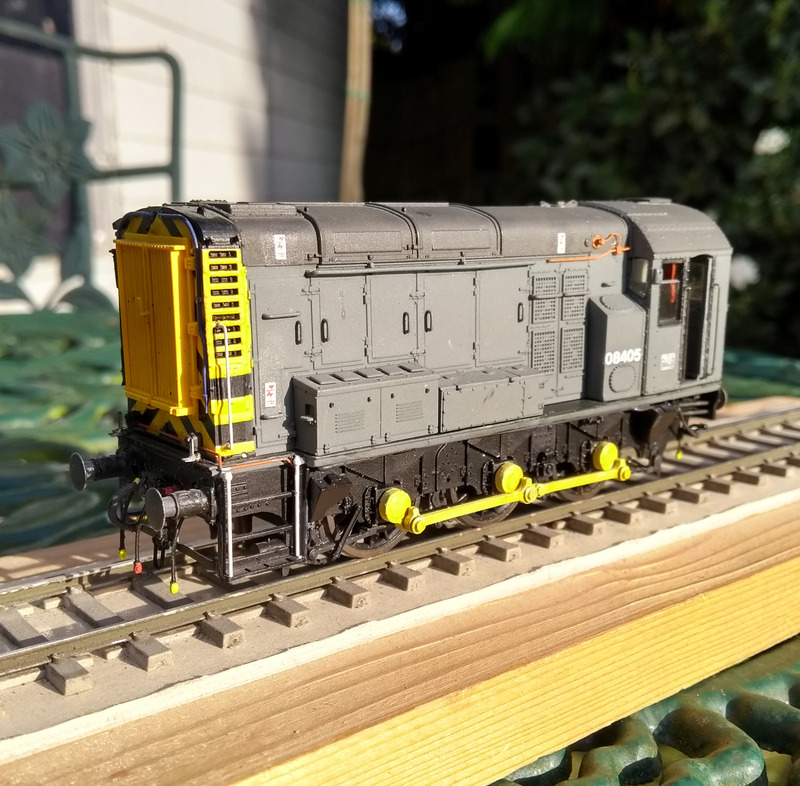 Having grown up through an era where Lima locos were both plentiful and cheap it’s not surprising that I would choose one as the basis for my model. The tooling is very well executed and the grilles and roof detail is delightfully subtle. The bogies too are beautifully moulded – though a mistake has meant pipe runs on both left and right hand frames so one side on each bogie requires this to be removed. The tough plastic needs care as knives can slip without warning when working with this material – I have an inch long scar on my left thumb which will testify to this. The battery boxes are also nicely done but this is where we begin to see issues. Where there should be daylight there is what can best be described as a ‘moulded gap’ which isn’t pleasing to the eye. The underframe work is substantial complete here, with only a couple of pipes missing at this stage. The white Plastikard helps highlight the changes made – the result is very different. This area was one where the Heljan model immediately looked a world away from previous generations of models but some years ago Gareth Bayer’s produced a wonderful series of articles in DEMU’s Update on modelling class 47s using the Lima model as a base. The second part which dealt with the underframes was a revelation to me at the time! I tried the method he described a long time ago for a 00 model of 47016 I was building and it was such a satisfying project. So when I came back to modelling 47294, this was an obvious route to take. The body, although good overall, does have issues. Round the cab mostly. All the windows have thick and unprototypical beading round them. 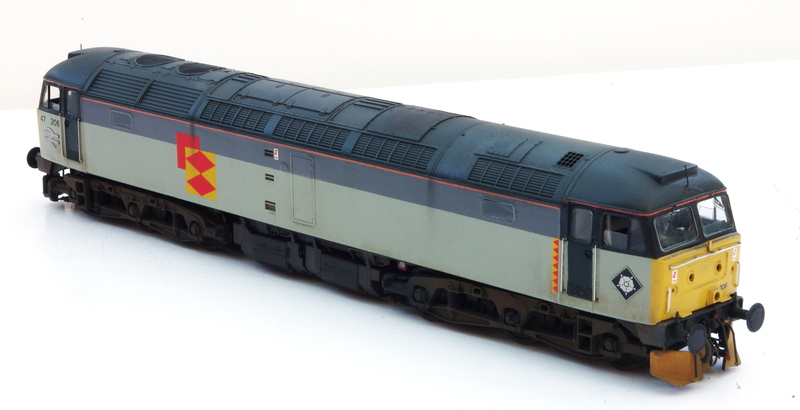 As Railfreight triple grey is very easy to patch around the cabs with the black window surrounds the front is an easy area to rectify whilst keeping the livery intact. This did mean I had to leave the bodyside windows alone which wasn’t ideal – something I changed on later conversions by opting for full repaints. The loco’s nose needs flattening on the top (as pointed out by Jim Smith-Wright here) too which helps with the face and I did this subsequently, though I think I’ve got away with it here! The front windows had Shawplan surrounds added but the side window etches were not available at this stage unfortunately. And of course replacing the handrails all round with 0,33mm nickel silver wire is a must – every little item just adds to the whole picture. The loco is complete here, aside from buffer beam pipework -at this stage none of the new parts had been painted which makes it easier to see where changes have been made. What I think had the biggest impact on the ‘face’ of the model was replacing the buffer beams. As it comes they are curved, matching the profile of the nose, which isn’t right at all. Removing this and replacing this with a flat piece of Plastikard makes a big difference. The side fairings of the valance should be at right angles to the buffer beam but instead follow the taper of the cab sides – I removed the angle which represents the loco’s frame and ran a new blade between the valance and the bodyside, before carefully bending it to the correct position – reinforcing with thin Plastikard is enough to make it strong enough to handle. The front end of the chassis – the rather rough and ready arrangement of the framing is made in such a way to be a good fit within the body. The loco frame which can be seen behind the valance was incorporated within the chassis – this adds a nice bit of depth to the area underneath the cabs, which makes it look a lot less ‘Lima’. The completed underframe – note the replacement springs on the bogies. Similarly the bogies can benefit from attention too – removal of the duplicated pipework on the secondman’s side of the bogies worth doing, despite the awkwardness mentioned above. And while you’re in a destructive mood… It’s worth removing the brake shoes from the bogies too. This might seem at odds with the approach to everything else but it’s what a graduate manager would call “an easy win” because we can improve appearances for a minimum of effort. Brakes moulded out of line stand out like sore thumbs, their removal creates space and shadows – our brains see the frames which look right and fill in the gaps for us, assuming other equipment lies in the dark depths of the underframe. Less is very much more here. I also removed the moulded inner coil springs which can be seen and fitted replacements made form soft 0,5mm steel wire (florists’ wire) which was wrapped round an old 1,5mm drill bit with a small section of Evergreen 2.5mm U section was added to the top of each spring to complete these. When this is combined with the brake shoe removal, this achieves a real sense of depth – the final touch on the bogies are footsteps from the Heljan model which nicely cover the rather flat Lima footsteps and give us a bogie which looks like a big heavy piece of equipment. The final items to be added were fan grilles from Shawplan – the Extreme Etchings version is a beautiful piece of work! Add them last as whilst they will stand up to some handling, it’s all to easy to knock them during construciton. You can guess how I know this. The finished loco – it still, however, requires lights to be fitted and I have forgotten about lamp irons… The buffer mounted ones are rather vulnerable once in place. Glazing is all cut individually from clear plastic sheet – before Laserglaze, a long and laborious task but well worth the effort. That covers most of the aspects of this particular model – it’s one where working from photos is key in order to capture the essence of the real thing. I still think that working from the older Lima models has real worth and it’s also a great way to venture deeper into detailing as you really can tailor it to meet your needs going as far as suits your requirements and nerves! This was the first Lima conversion, we’ll look at how it can be taken even further another time. 47380 ‘Immingham’ taking shape. The scratchbuilt underframe details can be scene as well as the cutaway buffer beams. The new window surrounds can be seen plus with work around the cab. This refines the model much more than the original 47294. Three figures which are waiting to be fitted – the seated driver is from Monty’s Models (Dart Castings) and the two standing figures are from Phoenix. A little preview of some of the smaller aspects of the project. I’ve spent a lot of time trying to improve how I approach painting figures – it’s gone in hand with how I’ve evolved my weathering methods, trying for a subtle approach to enhance realism. I don’t like see stark, bright figures on layouts – much like the untouched die cast bus on a road bridge, they can rather stick out like a sore thumb. I’ll leave it to you to decide if this approach is working. A little preview of a new project for West Halton. New Shawplan grilles waiting to be added – part of a whole host of parts from Brian Hanson’s wonderful range of parts! The basis for this is one of the newer Hornby models – a very nice model, albeit with a few minor issues which need attention. The roof fans are heavily inset which makes it look like the roof is made of three inch concrete rather than thin sheet steel – the delicate replacement parts from Shawplan are the perfect way to begin to rectify this. But first thing which needs to be done is to remove the moulded fan grille insert as well as the ledge which supports them – this leaves the hole oversize and this needs to be rectified in order to fit the replacement grilles. This is quite easy to achieve by using 20 thou Platiskard to create a cowling in the hole, which nicely replicates the appearance of the real thing – have a look at this photo on Brian Daniels’ Flickr stream and you can see the sort of effect that I want to achieve. The cowling before it has been trimmed back to match the profile of the roof – this gives an good idea of how this was achieved. I can’t take credit for this idea – I stole it from Paul Marshall-Potter! Imitation is the sincerest form of flattery after all! And it works very well too – improving appearance as well as resizing the hole back to scale size. The other main areas will be rewheeling, all round grille replacement, new glazing, repaint, weathering, etc., etc…. You get the idea.